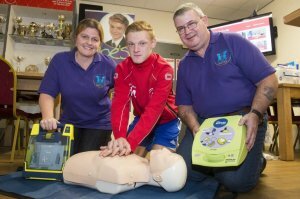 Joe's Mini Heartstart for Sports is a pioneering scheme, aimed at offering sports club members including players, officials and supporters the chance to learn cardio-pulmonary resuscitation (CPR) and how to use a defibrillator. 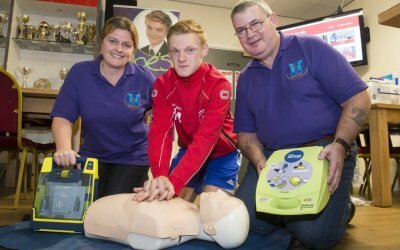 The free one and half hours emergency lifesaving course, endorsed and supported by Leicester City Council, BHF and Heartwize is one of the key priorities of the Joe Humphries Memorial Trust (JHMT). SADS is a group of lethal heart conditions that cause sudden cardiac death in young people. The physical exertion of sport can trigger SADS. This doesn't mean sport is bad for you – it just causes any underlying problem to show up. Many conditions can be treated and deaths can be prevented. Recognising any warning signs and acting promptly can mean the difference between life and death. For further information about SADS, see What is SADS? "I'm proud to be patron of the Joe Humphries Memorial Trust and I give my full support to Joe's Mini Heartstart for Sports. Nothing is more important than keeping young people safe and by ensuring that as many people as possible know how to react in an emergency situation, we are doing all we can to minimise risk to young lives." "Nothing is more important than players' safety, so we're delighted to have had this training, which will be of great benefit to everyone at the club. While we all hope we never have to use it, this training could one day mean the difference between life and death. 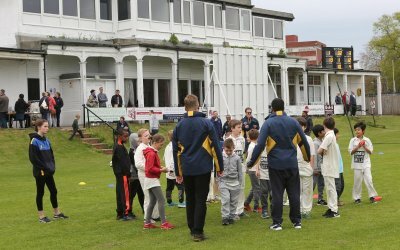 I'd encourage anyone involved in a sports club locally to get in touch with the JHMT and arrange a session." "The focus is on teaching people simple skills that could mean the vital difference between life and death." "If everyone in the UK was trained to do CPR (chest compressions), we could increase the survival rate to that seen in Sweden and some parts of the USA. 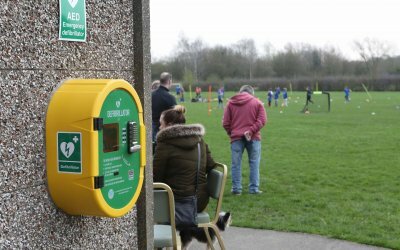 If more places in the UK had automatic defibrillator machines in public places, we could also increase survival rates – these machines can save lives, if used within eight minutes of the cardiac arrest." "This is a chance for us all to learn a few simple skills that could make a huge difference between life and death." "Every second counts when it comes to saving a life. I have first-hand experience of SADS. When my son was younger, he was part of Birmingham City's development squad. His coach was in his mid-20s and died on the pitch whilst playing. It was put down to SADS. I hope none of the lads ever have to use the techniques they learnt on the course, but if they have do to it's great knowing they will be able to act whilst waiting for paramedics."